Book Summary: In August 2006, the International Astronomical Union voted Pluto out of planethood. Far from the sun, wonder Pluto has any fans. Yet during the mounting debate over rallied behind the extraterrestrial underdog. Disney created an irresistible pup by the same name, and, as one NASA scientist put it, Pluto was "discovered by an American for America." Pluto is entrenched in our cultural, patriotic view of the cosmos, and Neil deGrasse Tyson is on a quest to discover why. Book Review: Growing up, I had always loved the idea that Pluto was the ninth planet in the Solar System. It had been my favorite planet because it seemed to be always neglected when it came to discussing the planets of the Outer system. I was even more disappointed when I learned that it had been demoted from a major player to that of a supporting role of dwarf planet. 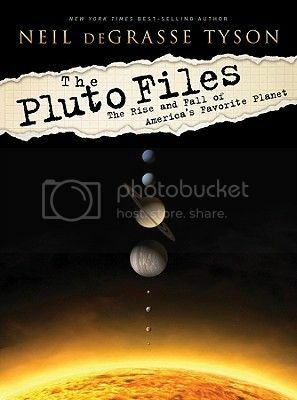 With the recent renewal interest of Pluto due to the flyby of New Horizons, I thought this book was the perfect read. I was not entirely disappointed. It was a nice light read filled with information from the mythology of the namesake Roman God of the Dead to the idea of people believing the planet was named after Mickey Mouse's dog, Pluto, to the cartoons. There were times I felt like the author was being defensive in trying to make a case for the reasoning behind the demotion of Pluto but it fell short to me. I guess I am just one of those older generations that has yet gotten over the idea and maybe I won't be ever. Still a nice read and one that people will either really enjoy or be disappointed by the reasoning and information provided.